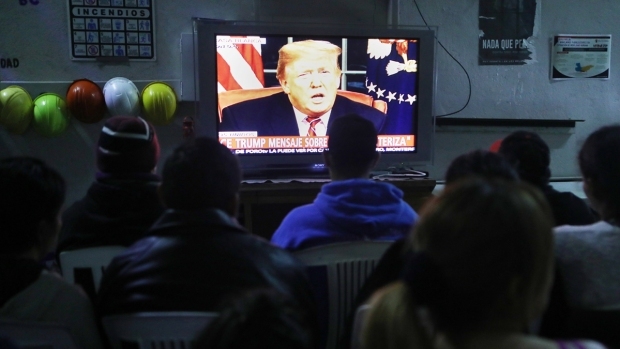 President Donald Trump made his case for a crisis on the U.S.-Mexico border in a speech to the country Tuesday night. But Trump and members of his administration have repeatedly made false statements about immigration, legal and illegal, to bolster a need for a wall — or at least steel slats — and baseless assertions that Mexico will pay for it, recently through the new trade deal. CLAIM: There is a growing humanitarian and security crisis at the southern border. FACTS: Border crossings have been falling for years. U.S. Customs and Border Protection reported just over 300,000 apprehensions for illegal border crossings in 2017, the lowest in more than 45 years and down from more than 1.6 million in 2000, according to FactCheck.org. The number rose in 2018 to nearly 400,000. And about 51,00 people were caught at the southwestern border in October and November 2018, more than in earlier months, according to CBP data from the 2019 fiscal year, NBC News reported. Two-thirds of undocumented immigrants arrived in the United States legally — often by flying in — and then overstayed their visit, according to a report from the Center for Migration Studies. And immigrants who overstay their visas have outnumbered those crossing the southern border illegally every year since 2007, more than 700,000 in 2017, according to NBC News. A growing percentage of people coming across the border are migrants from Central America who are seeking asylum. They are being driven by gangs, violence and poverty. CLAIM: The Southern border is a pipeline for vast quantities of illegal drugs, including methamphetamine, heroin, cocaine and fentanyl. Every week 300 of our citizens are killed by heroin alone, 90 percent of which floods across from our Southern border. FACTS:Trump’s claim that a wall would stop the flow of illegal drugs is discounted by most experts. And most illegal drugs — including the opioids that the Centers for Disease Control says kill 130 people in the U.S. each day — do go through ports of entry, as Trump has claimed in the past and which would not be affected by a wall. A DEA report in 2018 said: "Majority of the flow is through … legal ports of entry." The U.S. Customs and Border Protection told NBC News reporter Jacob Soboroff that, “Drug smugglers feel there are opportunities to mix in” at ports of entry. The vast majority of hard narcotics including fentanyl comes into this country through ports of entry or in the mail from China, Soboroff reported. CLAIM: "Last month, 20,000 migrant children were illegally brought into the United States, a dramatic increase. These children are used as human pawns by vicious coyotes and ruthless gangs. One in 3 women are sexually assaulted on the dangerous trek up through Mexico." FACTS: NBC News said that in December, according to data from the White House, about 32,000 “family units” and 5,000 “unaccompanied minors” were caught at the border. It further noted that there had been a surge of children and families apprehended. In October and November 2018, 10,265 unaccompanied migrant children and 48,287 migrants traveling as families were stopped at the border. As far as sexual assaults against women, Trump's figure comes from Doctors Without Borders. Amnesty International has estimated it is as high as one in 6 women. CLAIM: Among examples Trump gave of undocumented immigrants committing terrible crimes, he said, "America's heart broke the day after Christmas when a young police officer in California was savagely murdered in cold blood by an illegal alien who just came across the border. The life of an American hero was stolen by someone who had no right to be in our country." FACTS: Trump was referring to the December killing of Newman, California, Police Cpl. Ronil Singh, allegedly by Gustavo Perez Arriaga, an immigrant who police say entered the country illegally. There is no evidence that immigrants commit more crimes; immigration populations have been growing as the rates of crime, and violent crime, have dropped, The Marshall Project reported. Most studies have found no connection between immigrants and crime or have shown that immigrants revitalize neighborhoods. CLAIM: Democrats asked for a steel wall. FACTS: The president offered Democrats a steel border fence instead of a concrete wall, acting White House Chief of Staff Mick Mulvaney told NBC's "Meet the Press." CLAIM: Senate Democrats, including Senate Minority Leader Chuck Schumer of New York, have voted for border barriers in the past. FACTS: Schumer and 25 other Senate Democrats did vote for the Secure Fence Act of 2006, which authorized building a fence along about 700 miles of the border between the United States and Mexico. Trump characterized the fencing as "such a little wall, it was such a nothing wall," and during his campaign promised a concrete wall. He has since called it a fence and dismissed comments that he had abandoned a wall. CLAIM: "The wall will also be paid for, indirectly by the great new trade deal we have made with Mexico." FACTS: The revised North American Free Trade Agreement has not been approved by Congress, and would not take effect until 2020 at the earliest. There are no funds earmarked for the border wall, and any revenue raised by tariffs would have to be appropriated by Congress, NBC noted. And Trump campaigned on the promise that Mexico would pay for the wall.